Brosche criticized the mayor’s record on crime, noting in a news release sent by political consulting firm Full Contact Strategies that the recent killing of a gas station employee marked the 100th murder in Jacksonville in 2018. “This crime wave has forced me to take another look at challenging the current administration and its failed policies,” Brosche said in the news release. Brosche, Jacksonville's previous City Council president, told WJCT’s First Coast Connect in July that she was considering a run for mayor, after first floating the idea on air several months before that. “I’m still considering. It’s a big decision, and I’m still thinking. I often tell people I’m a recovering overthinker, so that’s where we are,” Brosche said in July. Both Brosche and Curry are Republicans, and the two have had a sometimes strained relationship, which came to a head in February when the city was evaluating whether to sell JEA. Brosche in her role as council president, refused to recognize Curry at a meeting about JEA. At the time Brosche accused Curry of trying to push through legislation regarding a JEA sale, while Curry maintained he had not taken a position on a potential sale. Later, discussion about selling JEA was shelved. With Thursday's announcement, Brosche’s focus was on crime alone. She pointing out that the FBI’s most recent Uniform Crime Report shows Jacksonville has the highest number of murders of any city in Florida. “While Jacksonville is a beautiful and vibrant city much like Chicago, the citizens here do not want the same reputation for violence,” said Brosche. Curry, who is running for his second term, successfully campaigned against former Mayor Alvin Brown, making crime a focus. Among Curry’s major initiatives since becoming mayor has been increasing staffing levels at the Jacksonville Sheriff’s Office and retooling the Jax Journey crime initiative into the Kids Hope Alliance. He also successfully championed a half-cent sales tax to help pay down pension debt. The qualifying deadline to run for mayor is January 11. Just because candidates have filed doesn’t mean they will ultimately qualify. 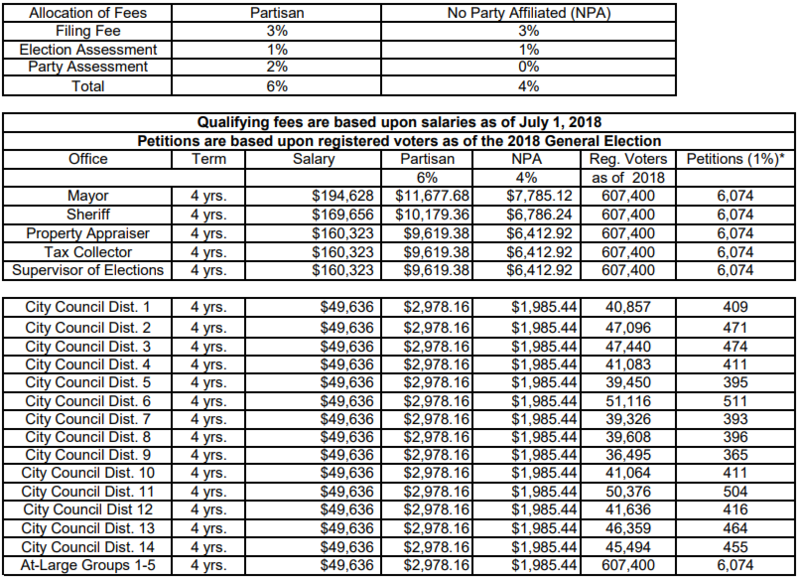 Candidates also have to collect enough petition signatures or pay a filing fee, which is $11,677.68 for party affiliated candidates or $7,785.12 for candidates with no party affiliation. The filing fees are based on the salary of the office, which in the case of mayor is $194,628. The first city election will be March 19. If no candidate receives more than 50 percent, the top two vote getters will face off in the general election on April 15, 2019.